Duetx – Business Consulting and Professional Services HTML Template. 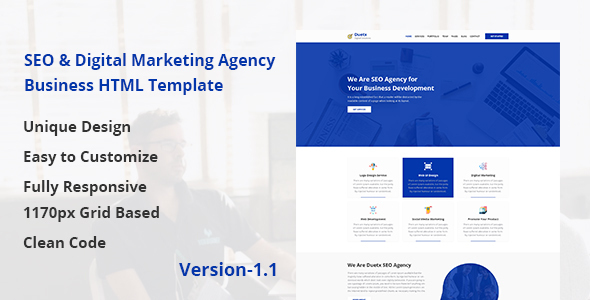 Duetx is clean, modern and professional Multipurpose Business HTML Template developed specifically for all types of consulting business, startup company, finance business, etc. Duetx is best suited for all kind of websites like Web Design Firm, Agency, Consulting Firms, insurance, loan, tax help, an Investment firm etc. This is a business template that is helpful for online presence for Corporate Business and Financial Firms. This template comes with necessary features for your online presence like a portfolio, blog, testimonial, and personal profile page etc. 14+ Valid HTML Files : In addition, you are getting 14+Unique HTML files. Everything is in Documentation file. Multiple features Looking unlimited Features? Duetx template comes with 10+ more page examples. Responsive Layout Design: Duetx is Fully Responsive & compatible on all of Devices. It has responsive layout & mostly fit on all of the devices.